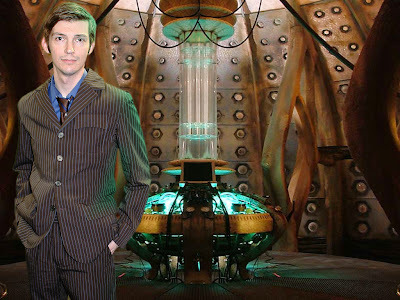 My deadline for the Ultimate Tennant Suit was to make sure it was ready for Kevin Coppa to wear at this year’s Gallifrey Convention. With just a few days to spare I got it done, and he was able to proudly show it off for all to see. The convention has several trails you can follow, depending on your personal interests. 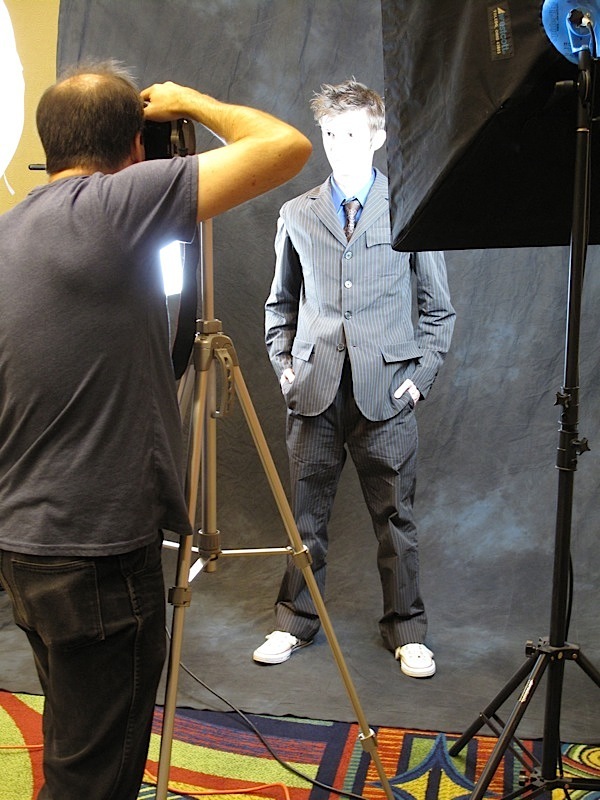 As part of the cosplay events over the weekend, Scott Sebring brings his professional camera equipment along and offers a free portrait service for anyone in costume! Kevin had his chance to get get some great pictures of him wearing his Tennant Suit, as well as a Tennant Coat I had made him. First they did some portrait shots of just the suit (see below). Time for a little confession. 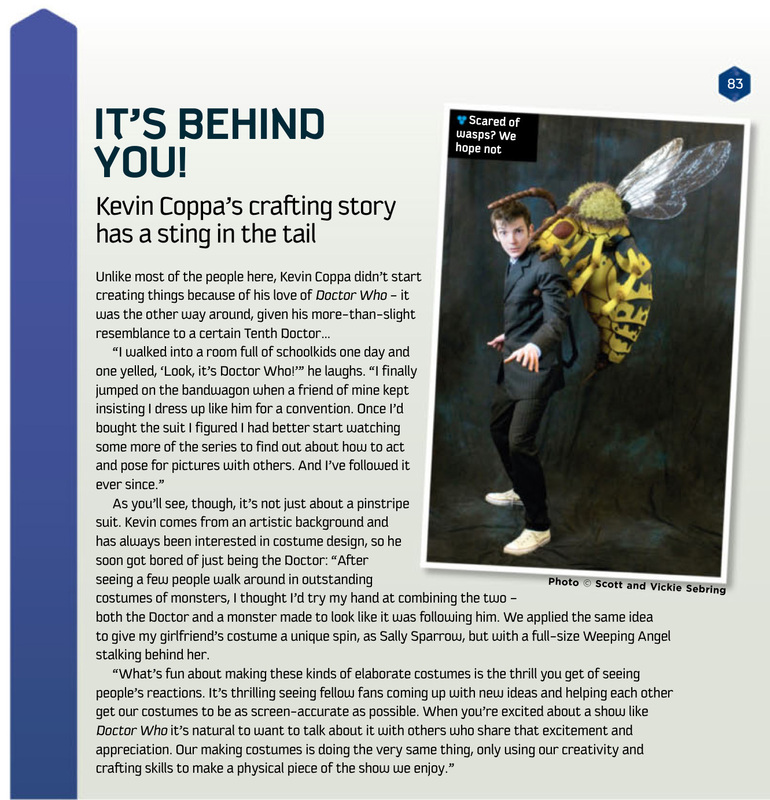 The Ultimate Tennant Suit I have made over the past couple of months wasn’t actually for me – it was a commission from a US-based client, Kevin Coppa. 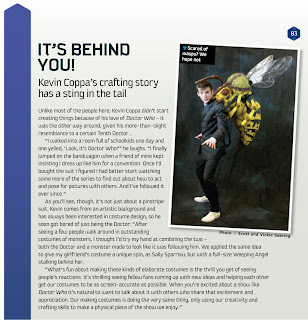 The photos of the finished Tenannt Suit have caused a bit of a buzz. To bring the pictures to a wider audience, I posted them on a couple of forums, one of which within a couple of hours had received over 20 responses! 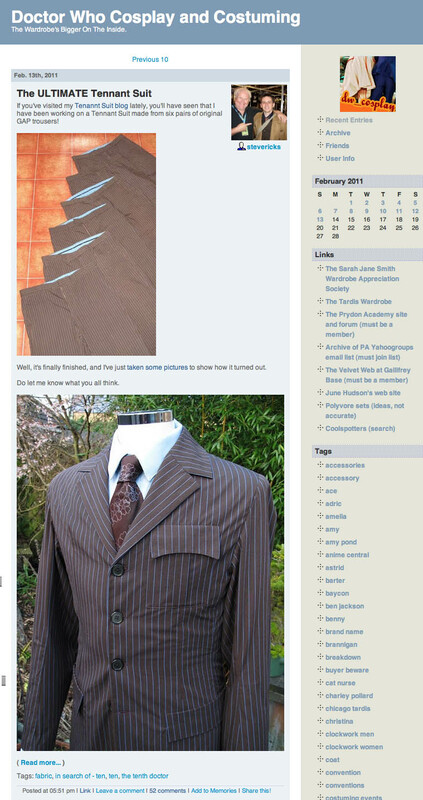 This also drove a fair bit of traffic back to my blog, which was hoped, but unexpected. I was able to look at the internet traffic to my blog and was astonished by the spike of hits I was getting. Below you can see the traffic for the week, ending with the increased level only hours after I posted the pictures. 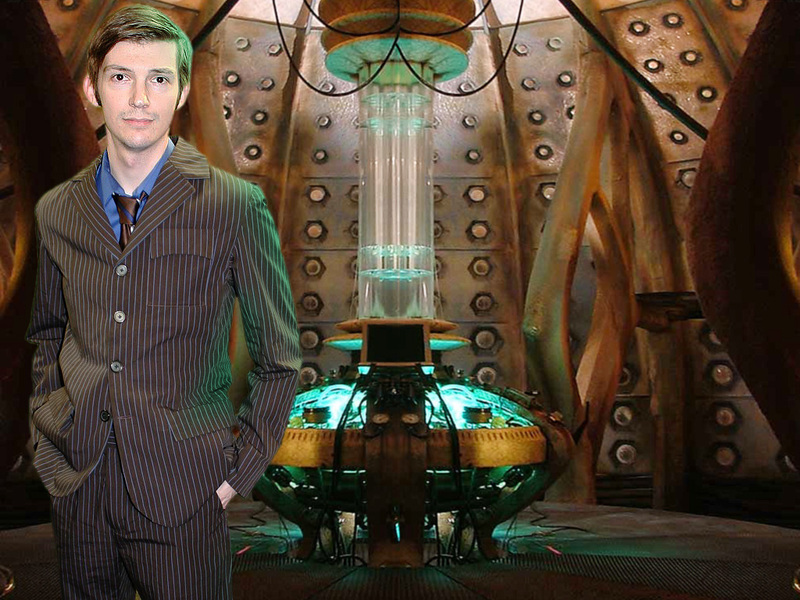 Ultimate Tennant Suit - FINISHED! 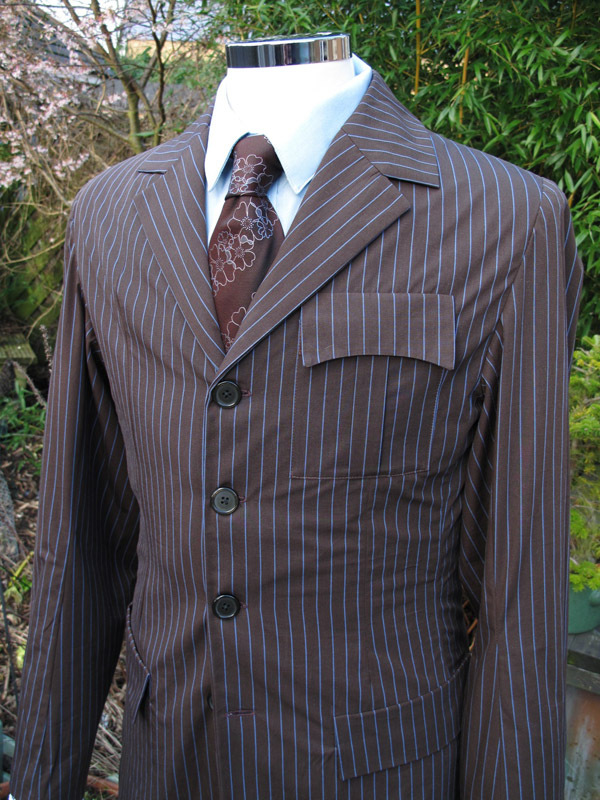 After several weeks sewing – a year gathering trousers – a couple of years knowing the fabric originated from GAP – the day has finally dawned when The Ultimate Tennant Suit is FINISHED!!!! I can’t hide that I am pretty cuffed about how well it has come out. I have spent a lot of time researching and studying the suit, as well as testing how to make it, all of which appears to have paid off. 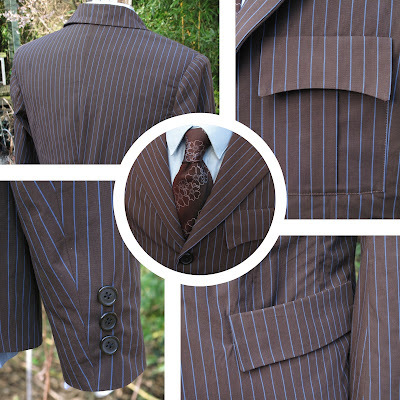 Here are some detail pictures of the completed jacket. The jacket of The Ultimate Tennant Suit is coming together well, and next I need to set the sleeves. 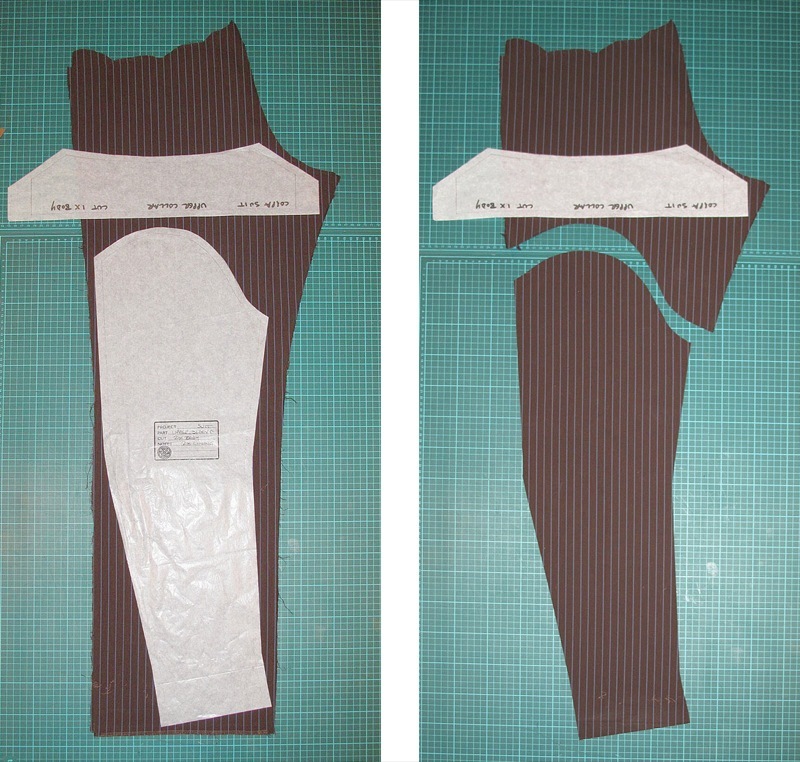 Assembling the sleeve is pretty straight forward - just stitch up the two seams! It’s what you do with it next that makes or breaks how well a sleeve looks on. 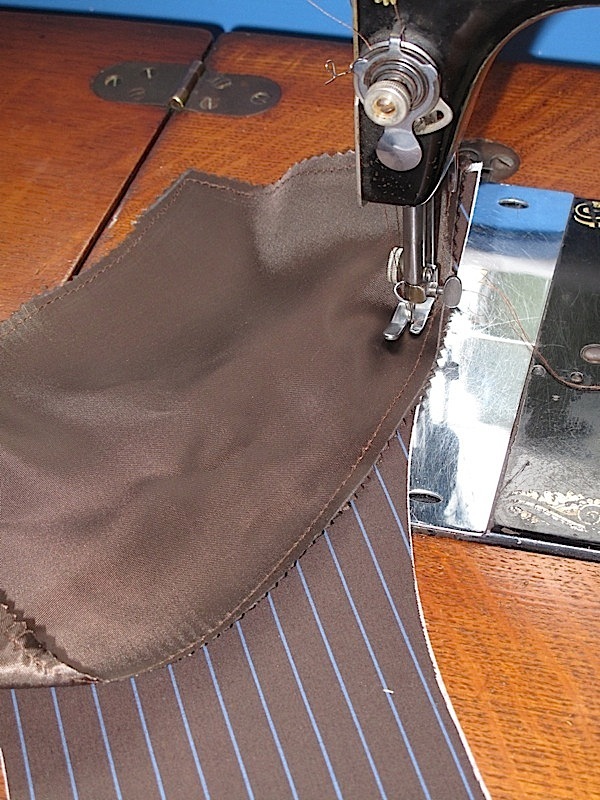 Once the sleeve is assembled, I stitch two parallel lines around the sleeve-head. I use a very strong thread, with my machine set to a very slack tension. 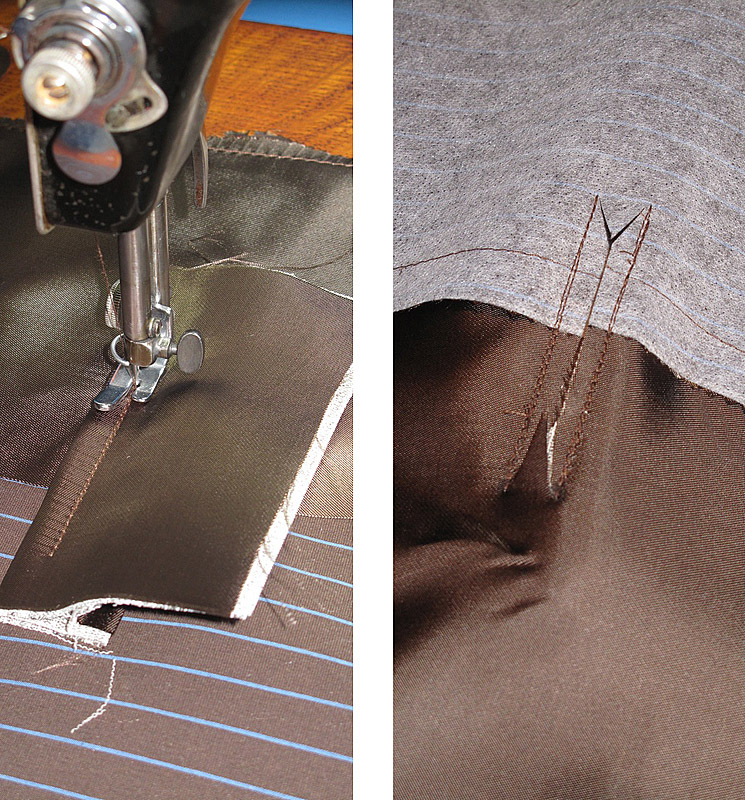 This allows me to pull the threads through to gather the head of the sleeve and shape it, creating a roll to it. Great care has to be taken to not gather too much and make puckers; or to not do it enough and nothing happen. 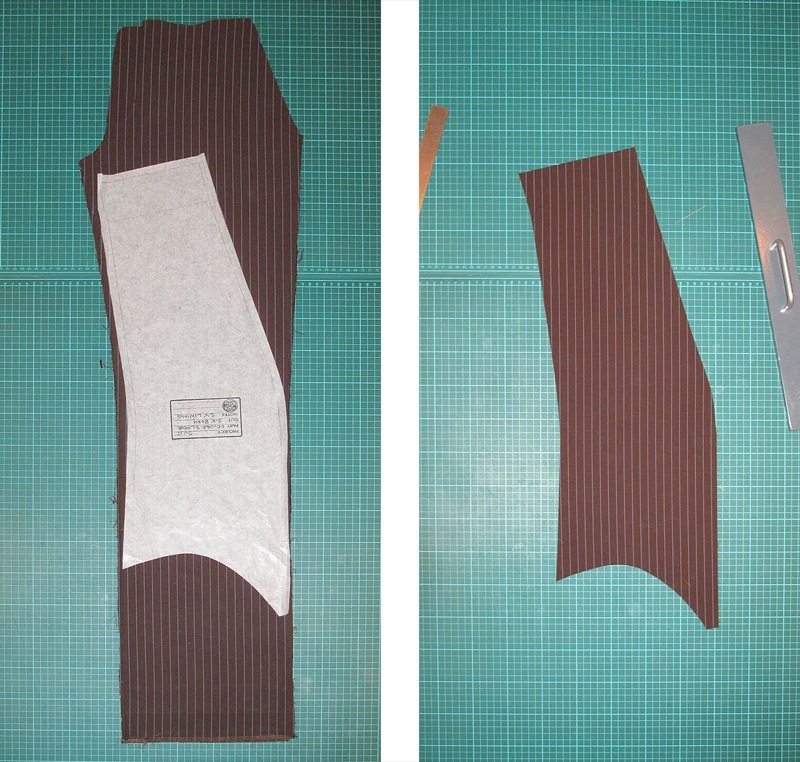 Next I fix the gathering and stabilise the sleeve opening by stitching a line of pre-shrunk cotton tape (see above). 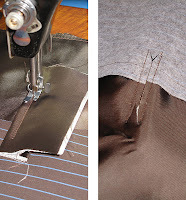 This sets the gathering so it can’t slip before sewing; and stops the underarm area sagging through repeated wear. Next I need to turn attention to the lapels and the inside pockets. I have patterned a special panel for the lapel facing and the lining, which when joined together equal the shape of the fronts (see above). 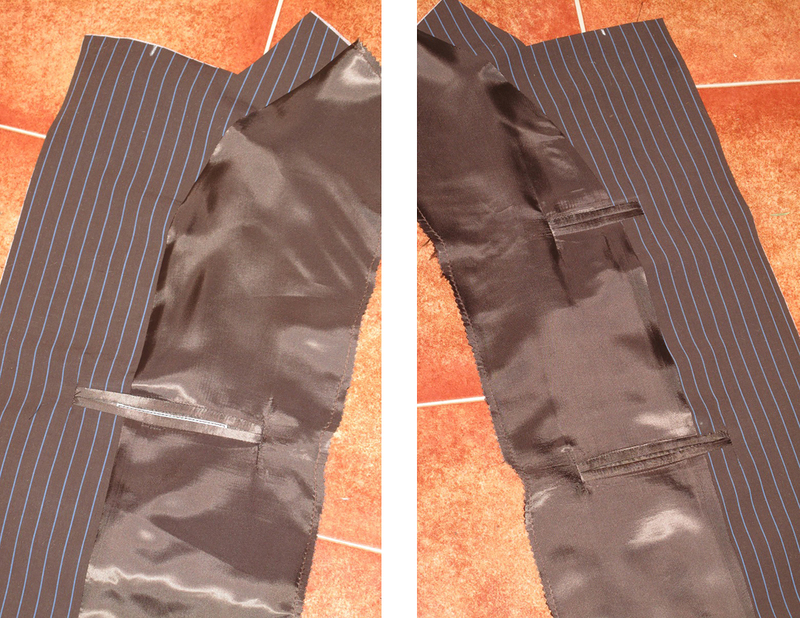 Into this I set the necessary welted pockets. I am doing three in total: one narrow one very high up to take a sonic; below this a wider standard pocket; and on the other side ranged in the middle a further wide standard pocket. I need to set the sonic pocket very high as it needs to be accessed without undoing the top button (see left). A point easily overlooked. The Phase One of the cutting gave me the fabric to circumvent the body of the jacket, as well as all I needed for the external pockets (see right). Everything went well, so it’s time to return to the cutting bench and prepare some more pieces for assembly. I am cutting the sleeves for the suit now, and its a pretty forgone conclusion that the lower sleeves will be cut from the fronts of the trousers due to their width at the shoulder (see left, top); and the upper sleeves are cut from the backs (see left, below). I need to angle the sleeves such that the top parts are on grain, and the forearms are a little bit across the grain. when I get to the assembly of the sleeves I’ll show why I have done this. 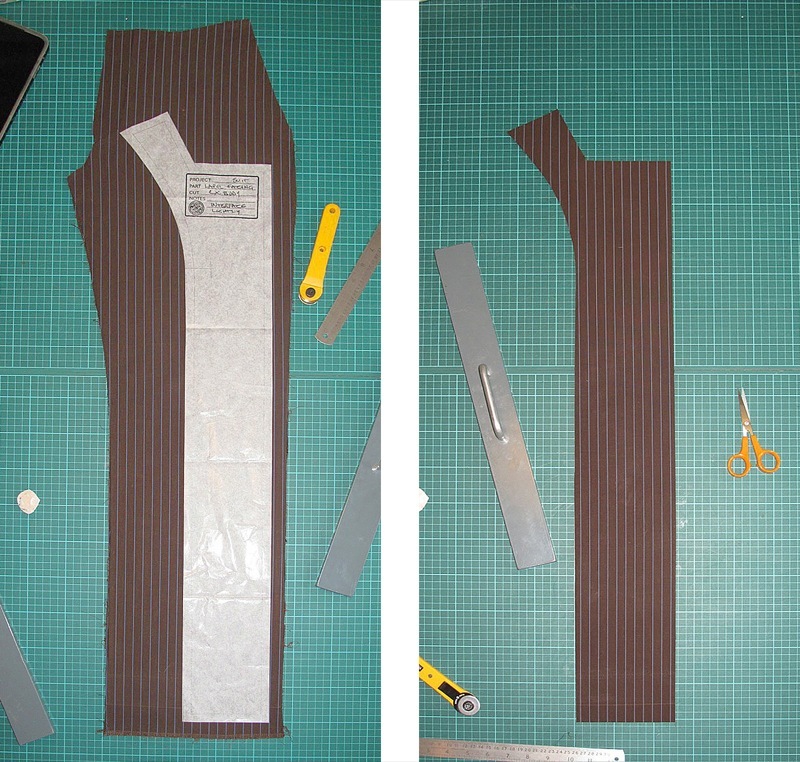 I have positioned the upper sleeves as low as possible, leaving me a decent piece of off-cut. 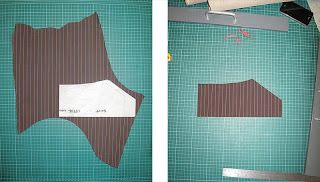 When I first cut fabric from the GAP trousers, I had quickly realised that I would not get fabric wide enough to cut the collar in a single piece. 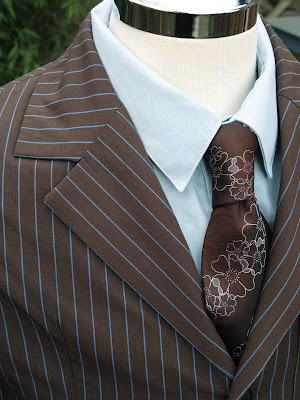 I concluded that the screen used suit must have a join at the back of the neck, so I will use this piece of left over to cut my collar. I cut this just before I needed to set it, to make sure I cut it to fit correctly. 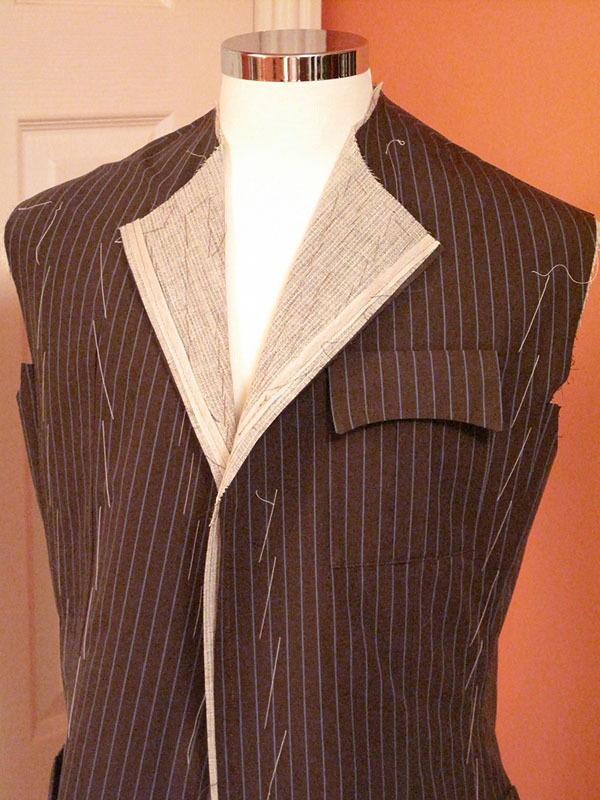 I’ve returned to the pair that gave me the back of the jacket to cut the lapel facings. 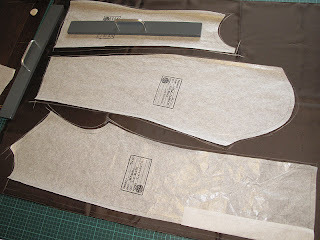 While I’m on the cutting bench and have the pattern pieces to hand, I also cut what I need for the lining. Most a straight repeats of the body of the jacket, but with a little adjustment to allow for movement and capacity inside the jacket. 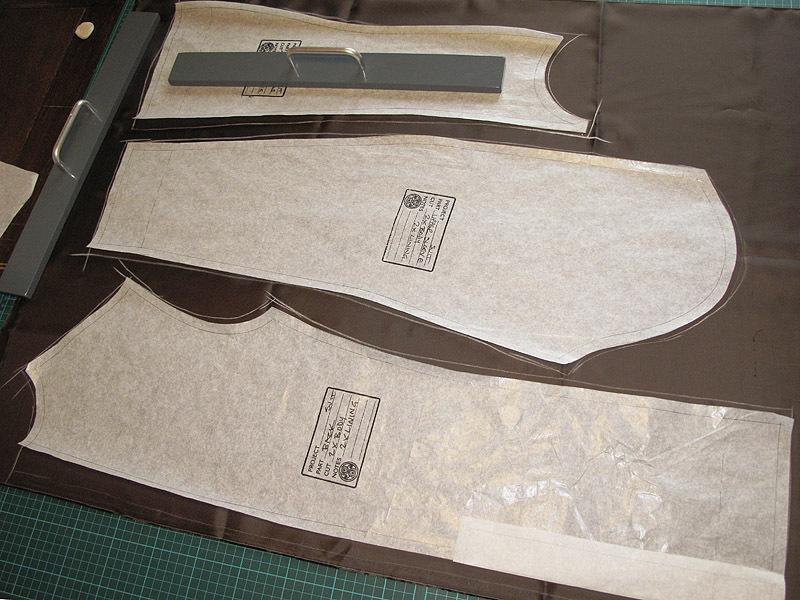 The backs are cut with the vent allowance (see above); and a special panel is shaped and cut to cover the front panel, minus the lapel facing. 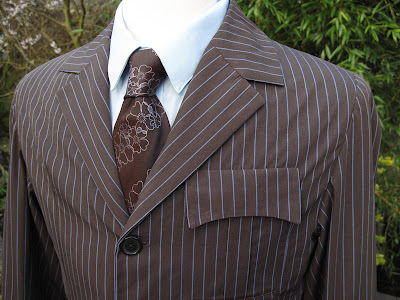 This is pretty much everything I need now to complete the Ultimate Tennant Suit! If you found this blog interesting, you might like to view my parallel blog about about making my Tennant Coat. 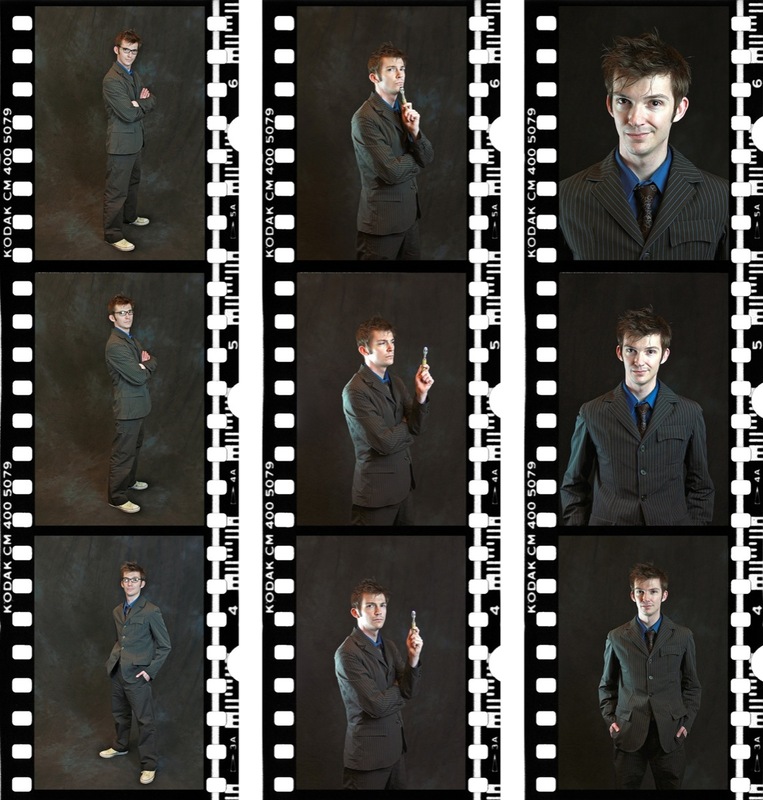 Ultimate Tennant Suit -ultimate photo-shoot!